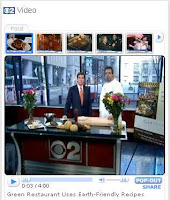 Daniel Ovanin, executive chef of Glen Prairie (1250 Roosevelt Rd., Glen Ellyn; 630-613-1250), was featured on CBS 2's weekend morning news Saturday, April 18. He spoke with anchor Mike Puccinelli about what it's like to be a green restaurant and use locally-sourced products, and he also demonstrated how to make Glen Prairie's Spiced Grilled Missouri Catfish, one of the new dishes off the restaurant's newly launched spring menu. Mike and Daniel also showed off three of Glen Prairie's other unique dishes-- Glen Prairie's Signature Meatloaf, Baby Wedge Salad and Grilled Dakota Farmed Bison Ribeye. Don't forget to celebrate Earth Day at Glen Prairie. The management and staff at Glen Prairie are committed to demonstrating sustainable living through energy and resource conservation, so on April 22, the restaurant will turn off or dim any non-essential lighting, set the cooling system temperature in publica areas at 72 degrees and make additional efforts wherever possible with staff to create awareness of sustainability. In case you missed the segment, you can view it here: http://tinyurl.com/cqqyvt. ASLF Teams Up with Gregg Helfer, Ltd.